After qualifying back in December, our team of 16 now travelled to Daventry IBC to take part in the ESMBA Rinks Finals. Of the 8 finalists, Devon, Cornwall and Cheshire had all withdrawn so the format had been re-jigged into a single round robin with the 5 remaining counties all playing each other. Each match was played over 9 ends with the result of each match depending simply on the aggregate shots over the four rinks (2 points per match). 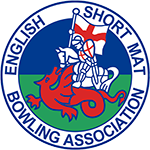 We opened the day against the West Midlands with 3 of our rinks having tight games (a draw and 2 mats losing by a single shot). Unfortunately the other rink (no names!) met Chris Willies’ foursome. Their front end had not warmed up and left the opposition too many opportunites to make key shots which they seemed unable to miss, leading to a 1-21 defeat. The second match against Hereford was again tight but 2 draws and a loss by 1 shot was salvaged by a 12-7 win on Neil Flynn’s rink, giving us 2 points. A defeat at the hands of Dorset followed with only one of our rinks winning but our final match against Somerset gave us another narrow win by 34-29. Thus we ended the day with 4 points and 3rd place and for some of us to ponder on where it all went wrong. The title went for the second year running to an undefeated West Midland team who beat Dorset in the decider.